Military delegations from around the world will head to London for Defence & Security Equipment International (DSEI) – the world’s biggest arms fair – on the 12-15 September. Many of these delegations will be from countries with abominable human rights records. At DSEI, they will meet weapons industry salespeople who will have filled the ExCeL Centre in London Docklands – normally a space for insurance industry conferences and car shows – with the latest in fighter jets, drones, tanks, machine guns and ‘non-lethal’ weapons. They will also be met with well-organised, innovative and relentless protest. DSEI (pronounced ‘dicey’ by activists) is sponsored by the UK government and BAE Systems. One of the goals of DSEI is to ensure the UK remains one of the top three weapons exporting countries in the world. When this event was held in 2015, military delegations from 61 states were invited. Of these, at least 14 are run by authoritarian regimes and several, including Saudi Arabia and Pakistan, were identified by the Foreign & Commonwealth Office as being serious human rights violators. Tellingly, eight protesters who tried to disrupt the fair were acquitted of any wrongdoing, after a judge accepted the argument that they were trying to prevent greater crimes from occurring as a result of illegal arms sales at the event. The court heard from witnesses describing the role of the arms trade in facilitating the repressive Bahraini regime, in Saudi Arabia’s bombing campaign in Yemen (which has used UK-made cluster munitions) and with Turkey’s internal repression of its Kurdish population. As a young journalist, I once attended DSEI on a press pass. Among the free bars and marketing gimmicks, I witnessed military delegations doing business with everyone from high-tech, Israeli missile companies to Nottingham-based, third party brokers of cheap assault rifles (photos here). Given the atmosphere, it did not surprise me to later learn that exhibitors have repeatedly been exposed for advertising equipment that is illegal in UK law. Journalists uncovered companies illegally advertising cluster munitions at the fair in 2011. Cluster bombs are weapons that contain multiple explosive submunitions, that many states outlawed by treaty in 2010 given their tendency to kill and maim civilians, particularly after the conclusion of a conflict. In 2005, the campaigning comedian Mark Thomas was illegally offered torture equipment by various companies at the DSEI. This time round, I will be joining the protesters. Manchester-based activists will be participating in a week of action leading up to DSEI, to prevent weapons and arms dealers setting up shop. 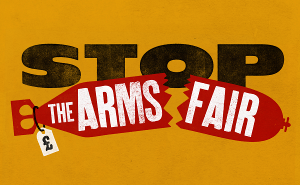 From anti-Trident groups building wind-turbines in the street to academics holding conferences at the gates, there will be plenty of creative ways to highlight, disrupt and troll the arms fair. To find out more and get involved, contact a local organiser via the Campaign for Nuclear Disarmament’s website by clicking here. This article was first published in The Meteor, Manchester’s Alternative Media, on 7th July 2017. Republished with kind permission.